Rosemary Oil Roasted Spaghetti Squash With Blueberries - At Thanksgiving? If we were playing a game where I ask you to complete this phrase: "Blueberry....?" Could you list 5 things that didn't include the word "muffin"? Have you ever connected the idea of Blueberries to Thanksgiving? Read on, friends, and prepare to get that "hooked-to-cook" feeling that sends us into the kitchen mixing, tasting and creating. 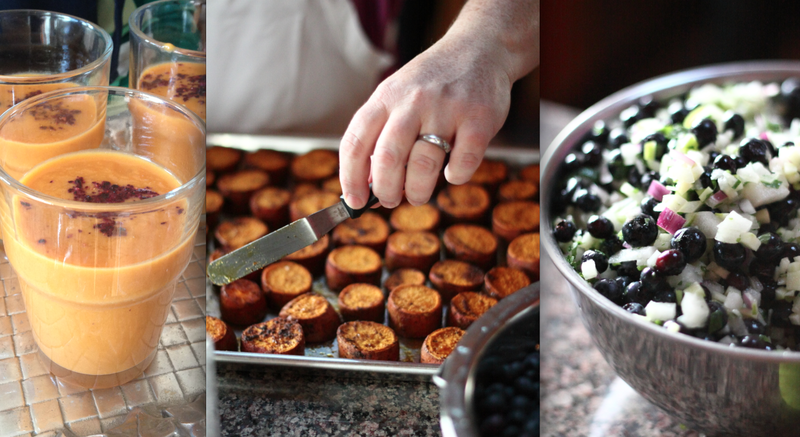 Last week I attended a "A Very Blueberry Thanksgiving" event in the lovely home of the inspiring Foodblogger, In Erika's Kitchen. and enhanced with pairings by Rioja Wines. I can't remember ever using Blueberries at Thanksgiving. Now, that will change. It was exciting to learn that fresh Blueberries will be available all year round in the U.S. because of the imports from Chile. The Southern Hemisphere has a growing season that is the reverse of ours in America. Just about the time our season is depleted, the over 32,000 acres of Blueberry fields in Chile are full for the handpicking and sharing. For my own Thanksgiving, I have my usual list of traditional recipes that I make just to hear my family ooh and ahh. I've learned from experience to "give the people what they want." 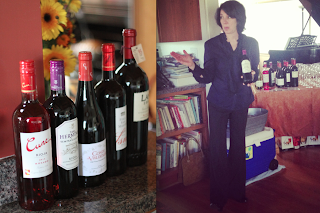 After that you can teach, grow, inspire or maybe challenge their ideas and taste buds. I usually throw in a few new dishes each year and some of those have happily become part of the tradition. Rosemary Oil Roasted Spaghetti Squash with Blueberries. 1) Prepare the Spaghetti Squash by cutting in half, spooning out the seeds, rubbing the insides with Rosemary Infused Olive Oil*, season with salt and pepper, and the Brown Sugar. 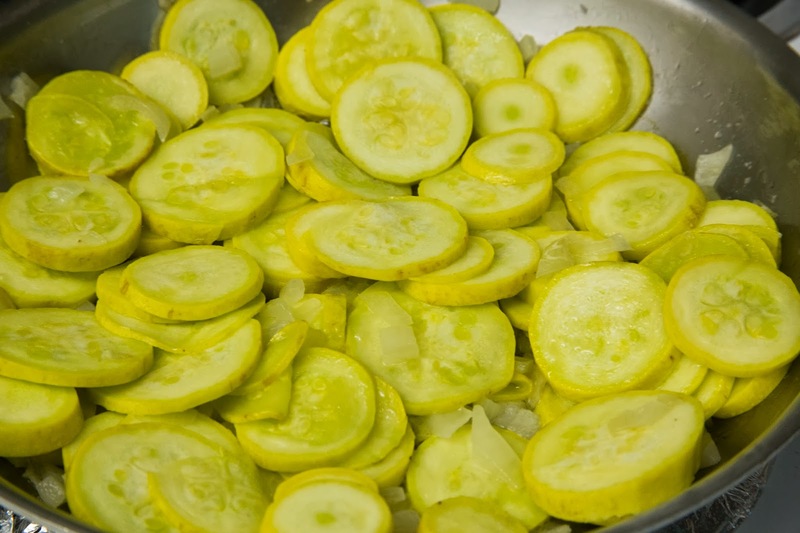 2) Place the squash, cut side down, on a parchment lined baking sheet and Roast in a preheated 350F oven for about 30-40 minutes. Remove from heat, turn over carefully and allow to cool for a few minutes. 3) Using a fork, scrape the inside of the squash shell (which will come out in "spaghetti-like" strings) into a bowl. 4) Toss the spaghetti squash strings with a drizzle of more Rosemary Oil, the herbs, salt & pepper to taste. Then toss in the Blueberries and Asiago. 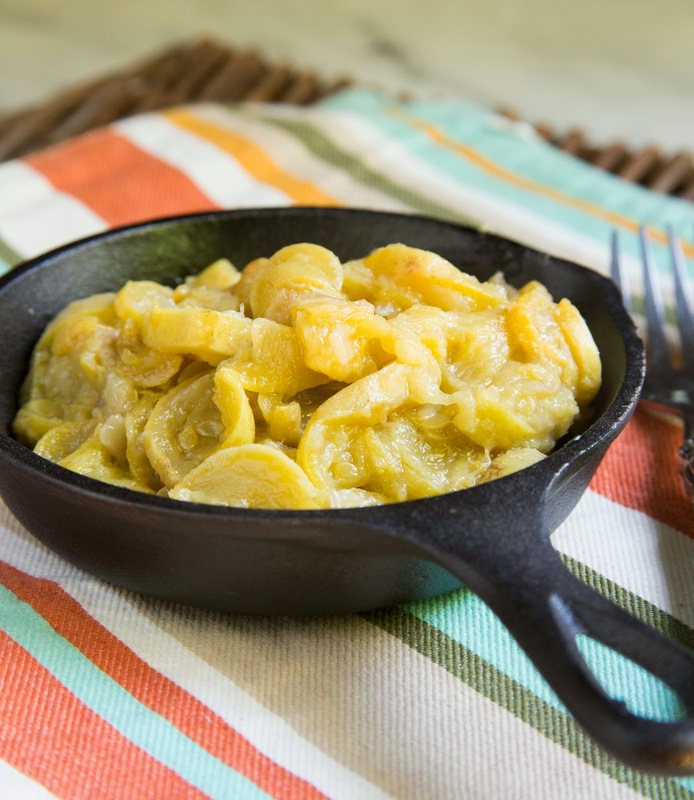 5) Serve in the Squash shells, or a serving bowl or platter of your choice. Garnish with the almonds. I'm always looking for another way to use all the squash and pumpkins that pop out in the Fall. I thought I had tried it all until I landed on a recipe for a Squash Cocktail. It's on page #35 in the very unique and exciting libation literature (recipe book for cocktails) by Greg Henry of Sippity Sup, called SAVORY COCKTAILS. I was lucky enough to be given his book to enjoy, and after a quick flip through I knew I wanted to buy two more for gifts. Here are the words that cross the rich brown almost suede cover of Savory Cocktails: Sour Spicy Herbal Umami Bitter Smoky Rich Strong. Its a great clue to the expansive range of recipes and information in this classy collection. Maybe even more than the recipes, I appreciated the information in the first 12 pages. It was like taking a mini-cocktail course that included a sprinkling of Greg's well-known sense of style and humor. So, Squash. In vodka. Crazy sounding, right? Maybe that's why I had to try it, too. It was just too interesting to pass up. In the end, I got one glass of it. I made the mistake of announcing to a room of friends during a viewing party for Discovery Channel's Gold Fever (my son-in-law played one of the leads) that I had a very unusual treat brewing on the bar. The color was gold and it seemed to be perfect for the theme of the evening, so how could I resist sharing? I think we will be serving this as our adult "signature" drink for the late hours on Thanksgiving Day just before we hit the leftovers and start sharing embarrassing stories about each other. The flavor is just a sweet hint of Butternut Squash with the loveable bite of a martini. Cheers and Blessings! 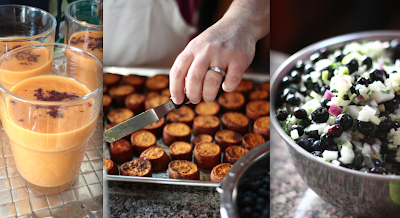 Make the Infusion: Roast a whole Butternut Squash in a 450F oven for about an hour until the skin is blistered. Remove from oven, set aside until cool enough to handle, but still warm. 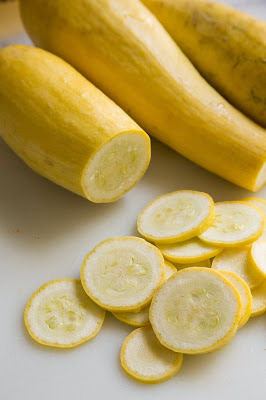 Cut in half and remove seeds and fibers. Pull off the skin and cut the flesh into 2" chunks. Place the pieces in a large, nonreactive container or jar. Add the Vodka while the squash is still warm. Cover and set aside in a dark area for 5 days, swirling the mixture occasionally. Taste the infusion for pronounced squash flavor, then strain the liquid through a wire-mesh sieve lined with a double layer of damp cheesecloth, discarding the solids. You can cover and refrigerate the liquid for up to 1 month if needed. There is enough "squash vodka" for several drinks. My mom says this is her mom's recipe. As a kid, I thought it was just okay. Then, just about college age I must have grown a few more taste buds because I fell in love with all vegetables. My Momma's Yellow Squash became my constant request when I was at home. I'm really weird about left-overs and hardly ever eat them, except for Thanksgiving turkey and dressing. However: I've been known to take this squash out of the refrigerator the next day, sit down and eat it right out of the bowl - cold and all. This is a wonderful way to usher in this month's challenge of eating only non-processed foods (EatingRules). My grandparents grew all their own vegetables and I remember helping pull these sunshine-yellow squashes with their fuzzy stalks off the ground vines. The only other ingredients are a tad of butter, oil, onions and seasonings. My mom said to be sure I reminded you that the most important thing about this recipe is to cook it low and slow until it's naturally sweet and tender. 1) Slice the Squash in thin circles (if the wide end is too big, cut in half and slice in semi-circles.) Season with salt. 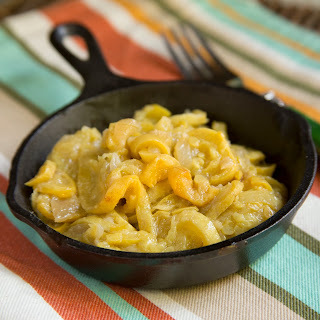 3) Turn the heat up to Medium, add the squash and allow to cook for a minute or two, then turn them over in the skillet. Repeat this step for a few times until most of the Squash has a little color. 4) Turn heat back down to LOW, cover and cook for about 30 minutes. Stir now and then and check for moisture. If they ever look too dry, add just a teaspoon of water, stir and recover to slowly cook. 6) Remove from heat and serve. Optional additions may be parsley, hot sauce or tomatoes. Ever wish you could put summer into a jar? Of course, the way my brain works I immediately started thinking of flavor combos and other dishes I could add that smokey peach experience to and preserve it. Preserve it. Doh! The next day I set out to enhance, tinker, tweak and jar what turned out to be one of my all time favorite recipes. It has the approval of at least one Los Angeles Fire Department Station (and that's a lot of hard working hungry people.) I sent in a giant jar with my son to work. I saw him later that day and he said it was almost gone. I had worried that it would go to waste on some forgotten refrigerator shelf, but I don't think it made it past lunchtime the same day. I call that success. Yay! Since the first batch, I've made several and it has become one of my go-to additions to fish, pork, lamb chops and salad dressings. It made some of the best Fruit Crumble Bars ever. Tomorrow I think I'll add in minced jalapeno for topping a burger. I'd love to hear how it works for you and let me know any ideas you come up with, too. Thanks for stopping by. 1) In a small bowl, whisk 1 Tbls. honey with 1 Tbls. lemon juice. Brush this on each piece of peach. 2) Place the peach quarters onto a well oiled and med/high heated grill or indoor grill-pan. 3) Cook and turn for about 3 minutes each side. Remove and cut into small pieces. 5) Increase the heat to Low/Med and continue cooking, stirring occasionally, for about 30 minutes. The mixture should rise to a low simmer. 6) Add the Basil leaves (whole) to the pot and continue cooking for about 20 more minutes or when the liquid in the pot falls from a wooden spoon in a large slow drop. 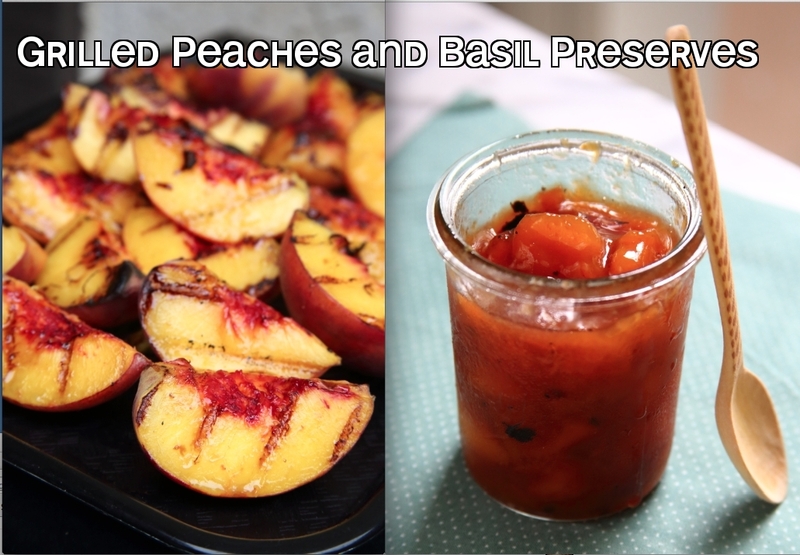 7) Remove the Basil leaves and pour the Peach Preserves into clean jars, close and refrigerate. **the sugar is reduced and no pectin is being added so this is a refrigerator jam only as written. I had a dream about Avocados. Obviously I'm a food nerd, or I have very disturbing Jungian Dream Symbol dysfunction. * I'd have to work fast, but maybe if it holds-up the avocado chunks would melt in the heat of cooking, the way the pieces of butter fat do, forming steam pockets. That is what creates the flakiness in pastry. * Folks who don't want to use butter, but hate butter substitutes would really love that, plus the added healthiness of California Avocado - wow, this could be great. * Who needs good pastry without butter? Vegans. It's hard to find good Vegan pastries with flavor and moisture and not too much sugar. But, that means no eggs either (FLAX MEAL is a great substitute AND - there's another healthy addition to use.) Oh wait, Vegan also means no cream, or milk or yogurt. COCONUT MILK - I love it, and it works so easily not to mention the taste. * Hmmm, I'm hungry - wish I had a leftover Choco-Chip cookie - (LIGHTBULB - make the scones CHOCO-CHIP!) It's true, I would almost eat anything with Chocolate Chips in it, but even I couldn't eat it for breakfast if it didn't taste worthy. When he emerged from the cave he calls his room, the plate was empty (cue the Angels choir.) Maybe you think a teen boy will eat just about anything, but you're wrong. It's quite unbelievable sometimes the weird stuff they eat, but they are also bizarrely picky. The topper came when he asked me if there were more. Oh yeah, there were more. Then I told him they were VEGAN. He paused, and only remarked, "Oh, yeah? I'll take one to Jileanne, she'll love it." Success - Dreams DO come true - if you bake them. Don't be afraid of these, if you don't eat Vegan. There's nothing but tons of flavor and easy fixing in this recipe. I thought about calling these: The Avocado Choco-Chip "Don't hate me because I taste so good without butter, cream or eggs" Scones, but it was hard to fit on a picture. 1) While Avocado cubes are chilling, whisk together in a bowl, the flour, baking powder, sugar, salt and Flax Seed Meal. 2) Working quickly, rub the chilled Avocado cubes into the flour mixture with your fingertips until the pieces are small pea size, generally. 3) Pour in the chilled Coconut Milk and toss together with a fork. 4) Add the chocolate chips and continue to fold in with a fork until the dough holds together. Empty it onto a flour covered work board or parchment covered counter. Here's a new take on a classic campfire meal, and perfect for the Summer grill. 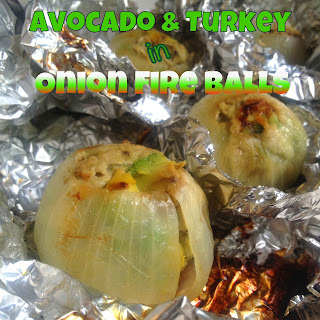 The secret ingredient is California Avocados. Okay, so avocados aren't so secret. In fact, this July 4th more than 96 million pounds of avocados will be consumed in the United States. I'll be doing my part, that's for sure. also naturally Gluten Free, Grain free and low in the bad fats.